Win an experience this Valentine’s Day! We are running a competition where you can stand a chance of winning a Valentine’s day experience for you and your partner. 1. Head on over to our Facebook page and LIKE us. Every Valentine’s we are bombarded with specials for chocolates, teddies, bubble bath and all other sorts of red and pink things…..expensive dinners, bouquets and silly cards!Why not make this Valentine’s Day one to remember? For us Valentine’s Day is about spending time together experiencing something new, or doing something you both enjoy! 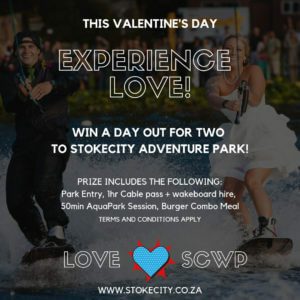 The competition is open to residents of South Africa aged 16 years or over except employees of StokeCity AdventurePark. Closing date for entry will be Wednesday 13 February 2019 Midnight. After this date the no further entries to the competition will be permitted. The winner will be chosen at random by software, from all entries received. The winner will be notified by DM on Facebook by no later than 5pm Thursday 14 February 2019. If the winner cannot be contacted or does not claim the prize within 14 days of notification, we reserve the right to withdraw the prize from the winner and pick a replacement winner. We will notify the winner when and where the prize can be redeemed.